Reflections on the design of Brittany Ferries G.B. A talk by John Shuttleworth at the Multihull Offshore Cruising and Racing Association A.G.M., January 1982. Firstly I must say that a lot of credit is due to Chay Blyth and Rob James who sailed the boat so well in the Two Star. Nevertheless the boat did turn out as good if not better than I had hoped and is certainly very fast in all conditions, apart from the fact that it is also very strong. I tried a lot of new ideas on the boat and it seems as if this was one of those cases where the whole turned out greater than the sum of the parts! Various articles have been published about the boat over the last year explaining many of the design features (see Multihulls International Dec 1980). So rather than go over old ground I thought tonight I would just outline the general design principles and then concentrate on the outrigger design and introduce some new concepts regarding the relationship between wetted surface area and speed. Then I would like to show why Brittany Ferries G.B. was faster than Elf Aquitaine and finally have a look at the future and try and indicate the direction I think design is going to take. Right from the start I wanted to design a strong, powerful boat with the accent on reliability rather than go for extreme light weight. In a race like the Two Star or OSTAR I am convinced that extreme light weight is a mistake because there is a risk of structural failure, and also some weight is necessary to drive the boat through the seas when going to windward. Another factor we underestimated in the past was the forces generated in these large boats when they accelerate so quickly to high speeds. It is not unusual to see apparent winds across the deck of Brittany Ferries G.B. in excess of gale force. So it really does not make sense to go light on the rig either. The other big factor which slows a boat down when going to windward is pitching; so I concentrated on finding ways to control pitching. Firstly I decided on a three beam configuration for strength, and because by concentrating the the weight nearer the centre of gravity of the boat pitching can be reduced. Also, the shrouds can be connected to the centre beam for extra stiffness. The hull shape of the main hull can be seen in Fig 1. This reverse curve above the water line adds an enormous amount of longitudinal stiffness to the hull and also provides a smooth entry for the beam to hull join, thus relieving stress at this important point. Down the centreline of the hull there is a bulkhead which has carbon fibre above and below it in the deck and hull, thus effectively forming an I-beam. All the fore and aft rig is connected to this bulkhead. The boat is extremely stiff fore and aft and we have a 10,000 lb. hydraulic backstay tensioner which provides forestay tension when going to windward. The underwater shape of the main hull is narrow and deep rather than wide and shallow. 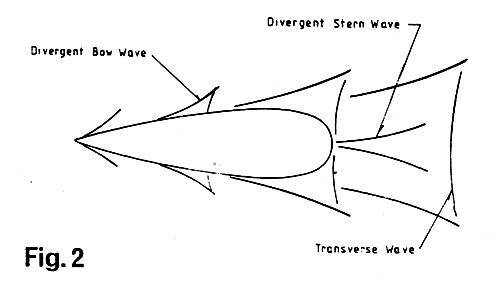 I believe that in light airs most of the resistance is due to wetted surface drag, and in stronger winds a combination of divergent bow and quarter waves. These long thin hulls do not seem to generate transverse waves and hence do not fall into their own trough and stick at speeds of 1.4 * sqrt (WL) as monohulls do. See Fig. 2. Transverse waves are of fundamental importance in the generation of wave induced resistance and it is of great signifigance that there is little sign of these waves around or behind the main hull of Brittany Ferries G.B. In fact she has virtually no wake unti 15 knots and then divergent waves appear. I use a small computer in drawing the hull lines to try and achieve the minimum wetted surface with minimum wave drag at the water line. Now I should like to discuss the outrigger which is different in shape to anything tried before, and contributed enormously to the success of the design. In order to look at the distribution of buoyancy along the hull we first have to look at a very different sort of boat - Eric Taberly's Paul Ricard. One of the significant things I noticed about this boat every time I saw it sailing was that it did not pitch. The reason is all to do with the position of the foil. If you look at the drawing of Paul Ricard in Fig. 3 you see that the lift of the foil is well in front of the centre of gravity of the whole boat. This produces a couple which resists the tendency to pitch. What is more important however is that the centre of lift of the foil stays in the same plane as a wave passes. Unlike an outrigger where the peak of the wave will move the centre of buoyancy aft as it passes the hull. And of course this will push the bows down (see Figs. 4 a and b). So in order to try and keep the benefits of the foil yet still use an outrigger I pushed the centre of buoyancy well forward and cut away all excess buoyancy low down at the stern leaving enough buoyancy distributed along the length of the outrigger to stop the boat from capsizing across my diagonal in favour of going over directly sideways. So if you consider the outrigger shape shown in Fig. 4c it can be clearly seen that as the wave passes the centre of buoyancy of the boat the profile is rising and the wave does not push the bow down again and hence the boat does not pitch. Now we come to the question "How much buoyancy should the outrigger have?" Apart from safety considerations it is important that the outrigger does not bury since this causes a great amount of slamming and actually slows the boat down. But it takes more than a 100% displacement outrigger to prevent burying. As the boat heels in stronger winds the wetted surface increases to a maximum and then decreases again as the main hull lifts out of the water. The outrigger displacing 6.5 tons (i.e. 100% displacement) as the main hull lifts clear. If we look at the first graph (Fig. 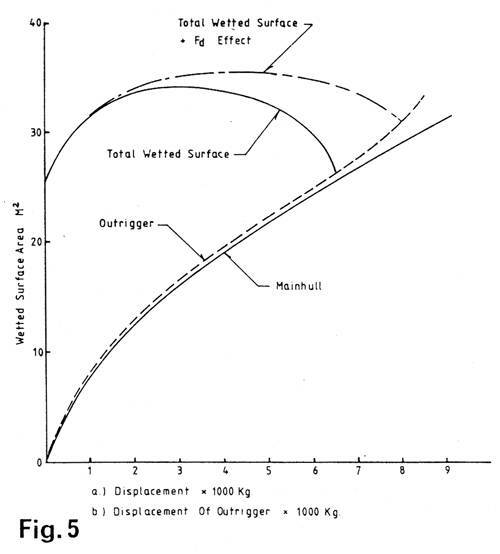 5a) showing the wetted surface of the main hull (solid line) and the outrigger (dotted line) verses the displacement of the hull, and then on the same graph, with the horizontal axis as outrigger displacement, plot the totasl wetted surface (outrigger and main hull) we have the curves shown in Fig. 5b. The curve is really describing the change in wetted surface as the boat heels until finally the main hull lifts clear of the water. However this is not exactly what happens. 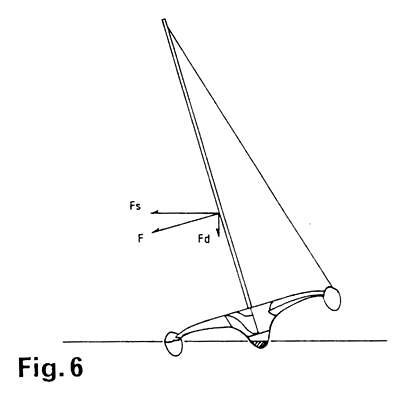 In fact as the boat heels there is an increasing down force FD from the sails, see Fig. 6. This component of down force on the sails becomes significant after about 7 degrees angle of heel. In Brittany Ferries G.B. at 20 degrees this downforce is approximately 1.25 tons which pushes both the main hull and the outrigger deeper into the water, thus increasing the wetted surface area. This effect can be caused both by wind force and by rolling in a seaway. Thus even if wind force alone is considered, a 100% displacement outrigger would be underbuoyant by 1.25 tons (from the point of view of potential performance), and sail would have to be reduced long before the boat had reached its maximum potential speed. In the case of Brittany Ferries G.B. 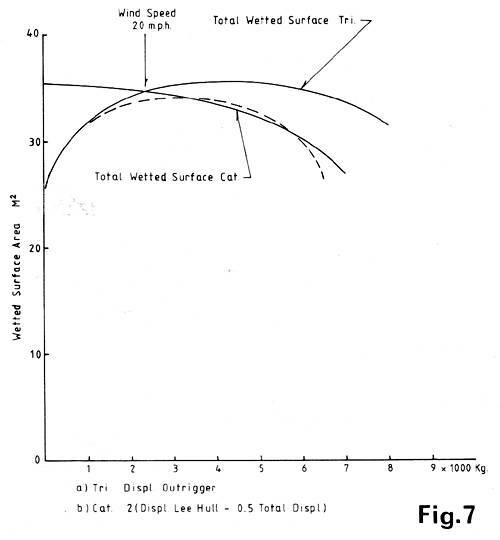 when the main hull is about to lift clear of the water the total apparent displacement of the craft is 8 tons, including FD, and the real curve for wetted surface versus outrigger displacement is shown in Fig. 5. 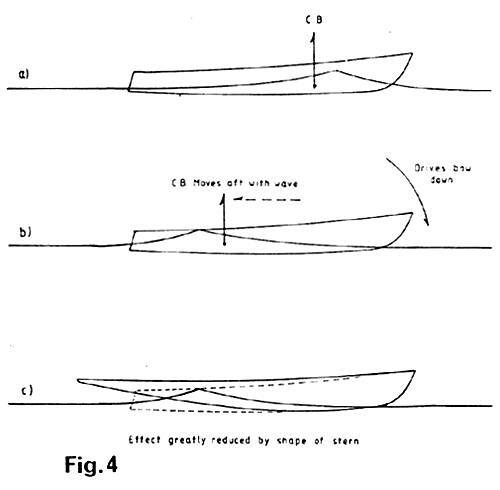 The final outrigger displacement was chosen to be higher than 8 tons to take into account dynamic effects and in particular to provide extra buoyancy right in the bow to prevent tripping when fast reaching in a quartering sea. Even so the bow of the outrigger has been momentarily submerged on a number of occasions sailing at over 25 knots off the wind, due mainly to the momentum of the boat. 6.5 tons may seem light for a 65 foot yacht but when it is moving at 25 knots it takes quite a bit of stopping. The final consideration was the distribution of the buoyancy along the length of the outrigger. This was worked out both by design and by model testing so that the boat was more stable across any diagonal than athwartships - in order to prevent a diagonal capsize either forwards or backwards. What are the practical results of all these ideas in practice ? If you look at the photograph of Brittany Ferries G.B. sailing hard on the wind you can see that the bows are well up. The front crossbeam is well clear of the water allowing the boat to go faster. Pitching is virtually eliminated and the fine stern leaves a very clear wake. I think the bows are lifting too much however and I have reduced the effect in Livery Dole III. This should keep the aft crossbeam clear of the water and improve windward performance still further. Now whay was Brittany Ferries G.B. so much faster than Elf Auqitaine, her closest rival in the race ? They both had virtually the same sail area and waterline length. Elf weighed 7 tons and Brittany Ferries G.B. 6.5 tons. On t he basis of sail area equal to mainsail area plus 100% FTA. MR=0.5(sqrt((SA*WL)/Displ.)) Thus the MR of Elf was 1.2841 whereas that of Brittany Ferries G.B. was 1.3315. (The larger the number the faster the boat). Thus on the basis of the MR, Brittany Ferries G.B. will be faster than Elf in average conditions. However there is more to it than that. Because of the inherent structural difficulties in a large catamaran Elf was half a ton heavier than Brittany Ferries G.B. but 4.2 narrower in beam. This causes a reduction in stability and therefore Elf had to reduce sail sooner than Brittany Ferries G.B. A problem made worse by the fact that Elf has a mast 83 feet high (Brittany Ferries G.B. 73 feet high). Thus once sail had been reduced Elf was dragging 10 foot more mast high up, just where he did not need it, thus slowing him down in heavy airs. But a much more significant difference occurs in light airs, where the dominant factor affecting hull drag is wetted surface area. Fig. 7 shows the curves of variation of wetted area as the boats heel. In the case of Brittany Ferries G.B. when the boat is at rest (no heel) the wetted surface area is 25.6 square meters and of Elf at rest 35.6 square meters. A huge difference. As the wind speed increases the boats heel more causing an increase in wetted area for Brittany Ferries G.B. and a decrease for Elf. At a windspeed of 18 knots the two curves cross and above that point Brittany Ferries G.B. has no advantage over tha catamaran as far as wetted surface is concerned. But Elf will reduce sail at 19 knots of wind speed and will lose power due to the extra mast height discussed above. Also above force 4 the catamaran will have trouble achieving adequate forestay tension because of the inherent nature of the structure (see earlier discussion of I-beam down the centreline of the main hull of Brittany Ferries G.B.). So what of the future ? Looking at Fig. 7 it is immediately obvious that a great improvement in the performance of the trimaran could be achieved in wind strength above force 3 to 4 by reducing heeling, and hence reducing FD. This could be achieved in two ways. One would be to increase the buoyancy of the outrigger still further and make the sections fatter and more rounded, so that buoyancy is picked up sooner, thereby reducing heeling. The other way would be to use a hydrofoil on the outrigger. If the lift of the foil can be controlled the boat can be made made to sail level at any speed thereby reducing FD to zero, the trimaran would have less wetted surface than the catamaran in all conditions. Ideally this foil should be retractable in light airs where the slow speed would reduce lift below a useful level. 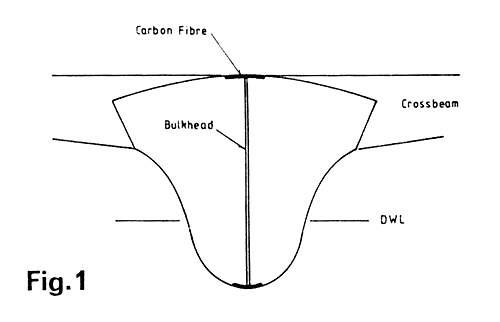 At present hydrofoil theory shows that a hull plus hydrofoil both immersed have greater drag than either a hull on its own or a foil on its own. However I am at present working on a new theory and model testing that shows that in the application of the trimaran described above the combination of foil and hull can provide reduced drag because of reduction in wetted surface drag due to heeling.